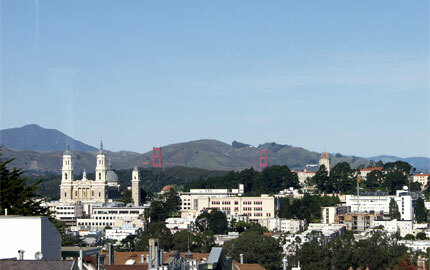 Beautiful View Home, in desirable Ashbury Terrace in the geographical heart of the city. Elegant, relaxed entertaining with view patio terrace, 3 bedrooms & 2 baths, including a spacious view master suite. Handsome living room with fireplace, formal dining room, large eat-in kitchen and breakfast area, state-of-the-art view media/family room, office/playroom, hardwood floors and wonderful gumwood architectural details. The home is entered through an impressive bank of gumwood French doors into a FOYER with Italian marble floors and a gracious staircase. The LIVING ROOM features a travertine marble fireplace with natural teak mantel and built-in bookshelves on either side. Architectural elements include boxed beamed ceiling with deep crown molding, generous bay windows along one side of the room, fruitwood wainscoting and oak flooring. The formal DINING ROOM with similar architectural details features a large picture window and pocket doors- a wonderful room for entertaining and holiday gatherings! 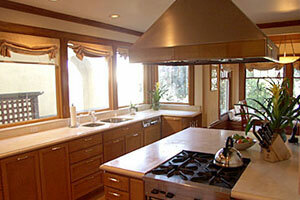 The top-of-the-line gourmet KITHCHEN has been thoughtfully designed-aesthetically and practically. It has massive double glazed windows, and abundance of recessed lighting and marble countertops. Comes equipped with a built-in breakfast seating area and Kitchen Island. Appliances include a Sub Zero refrigerator, Kitchen Aid dishwashers, 4 burner US range, stainless cooktop hood trimmed in brass and Credo double ovens, all in maple to match the cabinets. Additional details for the serious cook include deep storage drawers, spice drawers, tray storage, instant hot water, dishwashing liquid dispenser, under mounted sinks and fine china and flatware storage. Built-in stereo system with speakers in all rooms on this level included in sale. This light and bright view level consists of two BEDROOMS, a full BATHROOM and a state-of-the-art MEDIA ROOM with spectacular views! Architectural details including gumwood wainscoting and recessed lighting adorn this level. Natural lighting fills the hallway form a large skylight. The MEDIA ROOM, designed by Dareen Joy of North American Stijl Life, includes a built-in 45 inch screen TV (included in sale), recessed lighting and automatic blackout window shades for movie viewing. Thoughtful design customization such as built –in cabinets, window seating hiding an abundance of storage, intricate woodwork detail on ceiling, and small balcony. 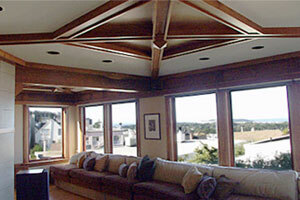 Spectacular views makes the media room a focal point for fun gatherings. Two additional BEDROOMS and a full BATHROOM with tub/shower. The charming southeast bedroom and southwest bedroom, with lovely garden views, both enjoy light and bright outlooks. 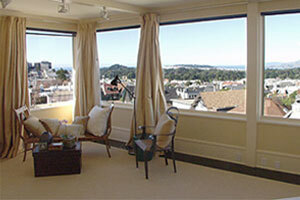 Full floor MASTER SUITE looks out a spectacular view of the Pacific Ocean, Golden Gate Bridge, Angel Island, and the Marin Headlands. 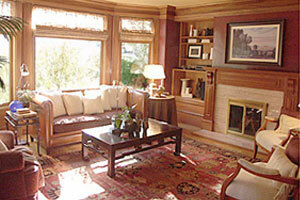 Custom window coverings provide protection from sun exposure and provide privacy. Large NURSERY or DRESSING ROOM off the master bedroom includes closets with a stackable washer/dryer. The master BATHROOM features a separate shower in limestone and a Villeroy & Boch bathtub. Off the hallway is a large walk-in closet with a vanity sink and mirrored medicine chests. From the hallway, French doors open to a delightful south view TERRACE. OFFICE area is located at the base of the stairs off the kitchen and FAMILY ROOM. One-car GARAGE with interior access into main level kitchen. Abundance of storage space on the garage level. 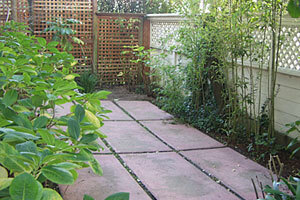 Access to the small garden and a tiled patio. A bath is also located on the garage level.